How does compassion play a role in ecological conservation? In what way does our treatment of animals impact the way we treat ourselves and the planet? Marc Bekoff is an animal behaviorist who argues that turning away from human exceptionalism and theoretical prejudices are the keys to expanding our compassionate footprint and making our conservation efforts more effective. As the author of more than 1,000 essays and 30 books, Marc is a leading voice in the fields of ecology, animal behavior, and cognitive ethology. Among his many accomplishments, he, with Jane Goodall, is a co-founder of Ethologists for the Ethical Treatment of Animals, and he was the first American to win his age class at the Tour du Haut Var bicycle race. Marc joins us in this episode to discuss empathy, dissonance and connecting with who nonhuman animals are. Our diets are forever evolving and never perfect, but if we allow ourselves to have compassion and understand the journey, we can get to a healthier place. Nik Tyler lives this philosophy daily. He’s an actor, vegan, and the Celebrity Relations Manager for Mercy for Animals, the leading farm animal protection non-profit organization. Nik was raised as a vegetarian, taught to honor the Jainism belief of ahimsa or to do no harm. However, he still struggled with sugar and vegan “junk” food, and it took time for him to practice compassion toward himself and his body. A once outspoken animal activist in college, Nik continues to advocate for the vegan lifestyle, but with a bit more tact. He has come to understand that compassion is inherent in all of us, but we each need time to realize and act upon it. The most effective traits of an activist are patience and the ability to listen, according to Nik. How can a vegan lifestyle help heal your mind, body, and spirit? Before becoming a personal trainer certified in plant-based nutrition, Bianca Taylor started her fitness journey as a bikini bodybuilder. When you hear about the rapid decline of our resources, coupled with the growth of our human population, do you wonder what you can do to help save the planet? Matthew Prescott, author of Food is the Solution: What to Eat to Save the World, joins us to talk about a very convenient truth: the world can be saved with every bite. As the Senior Director of Food and Agriculture of the Humane Society of the United States, and as a speaker invited to TEDxUCLA and Talks at Google, Matthew’s advocacy has lead to changes on individual plates, and in major food companies. You’ll learn how we can all do more with less, how eating locally is not always eating ethically, and why we need all forks on deck to save the world. The inefficiency of our food system. Why saving the planet is easier than you think. Busting the myth that we need to get our protein through animals. The resources that really go into making a breakfast sandwich. Why locally-sourced foods don’t cut it. Why changing your diet is more convenient than limiting yourself to the same bland foods. Matthew’s suggestions for the first steps toward going vegan. Follow Matthew Prescott at matthewprescott.com, on Twitter at @MatthewPrescott, or on Instagram at @MattPrescott. You’ve heard all the myths surrounding plant-based diets: it’s not sustainable as an athlete, or easy when you travel, or fun if you’re a foodie. Robbie Balenger is about to bust all of those myths in one 3,000-mile run across the United States. Robbie first laced up his shoes six years ago to alleviate his stress as a restaurant manager. Since then, his career and running paths have coalesced into a passion for endurance athleticism powered by plants -- and vegan ice cream. He joins us to chat about his journey to plant-based wellness, how he plans to fuel his body over the seventy-five-day excursion, and how he hopes to inspire other people to thrive while eating ethically. He hits the pavement March 15th in Huntington Beach, sponsored by Switch4Good and NadaMoo! How Robbie turned to running to deal with stress. Robbie’s journey to a plant-based diet with an ethical focus. The motivation behind Robbie’s transcontinental attempt. Slaying myths about travel, being a foodie, and being a plant-based athlete. How Robbie suggests people transition from one lifestyle to another. What are we really ingesting when we drink cows’ milk? What are mothers passing through their bodies to their children? What in the world is a dairy allergy? Dr. Vivian Chen dives into the dangers of dairy and her story of transitioning to a plant-based diet after a battle to diagnose the root of her infant’s feeding problem. As a double-certified physician, Dr. Chen has seen a host of improvements in her patients when they cut dairy and address their lifestyle. She’s going to tell you the sneaky ways dairy might be affecting you -- and your children. Defining dairy allergy, and distinguishing it from lactose intolerance. The top four allergies Dr. Chen says mothers should look for. Ethnic diversity in allergy prevalence and the difficulty in testing for allergies. Delayed vs. acute symptoms and allergies in adults vs. babies. Elimination diets to discover the root of your symptoms. The effects of casein metabolizing into casomorphin. Follow Dr. Chen at allergyfamilies.com and platefulhealth.com, or on Instagram at @plateful.health. Everyone experiences the occasional food craving, but for some, certain foods become a true addiction. Why are some people wired to crave certain types of food so intensely, and how can we break free of it? Dr. Susan Peirce Thompson, founder of Bright Line Eating, answers these questions and explains her strategies for managing food addiction and achieving sustainable weight loss. We are fascinated by her method and believe everyone can gain from her knowledge and establish a healthier relationship with food. The science behind food addiction. Strategies to cope with food addiction. Dr. Peirce Thompson’s food philosophy and weight loss barriers. Find Susan at Bright Line Eating, pick up her book, Bright Line Eating: The Science of Eating Happy, Thin, and Free, and take the food addiction quiz at Foodfreedomquiz.com. What actually is diabetes? How is it caused? What’s the difference between type 1 and type 2, and is sugar or fat to blame? Robby Barbaro and Cyrus Khambatta answer these questions and more during our chat today. Both were diagnosed with type 1 diabetes and manage it with a low fat, whole food, plant-based diet. They’ve teamed up to create Mastering Diabetes, a coaching program to help others feel their best while managing their symptoms. They even tried to help our audio engineer, Michael, move away from his meat-heavy diet! Get out your keyboard–you’re going to want to take notes during this fun yet informative conversation. Defining the 5 types of diabetes. The difference between natural and refined sugar. How a plant-based diet can reverse prediabetes and type 2 diabetes. Robby and Cyrus’ low fat, plant-based whole food philosophy. How to eat for longevity and to lower your risk for chronic disease. Recommended reading: 80/10/10 Diet by Dr. Doug Graham and Whole by Dr. T. Colin Campbell. Follow Robby and Cyrus at masterdiabetes.org or on Instagram at @masteringdiabetes You can also find their personal profiles on Instagram: @mindfuldiabetic (Robby) and @mangomannutrition (Cyrus). Giacomo Marchese is a successful natural bodybuilder and coach, but he wasn’t always the epitome of perfect health. After discovering the sport of bodybuilding at a young age, Giacomo became severely anorexic, forcing him to step away from competitions for several years. After overcoming his eating disorder and harnessing a healthier mindset around food and exercise, Giacomo eventually made his way back to what he loves and now coaches others in bodybuilding and general weight loss and fitness. His secret weapon? Sleep, hydration, and a plant-based diet! Giacomo recommends a blend of pea and rice for the optimum, easy-to-digest protein powder. Actress. Photographer. Ballerina. Influencer. Agnes Muljadi has an impressive resume with an even more impressive Instagram following—530K. But she’s not after followers. She’s interested in ethics and serving as a positive role model for young girls. We dive into a number of wide-ranging topics in this episode, from her overnight transition to veganism after a health scare to using her social platform to create positive change and mentor others. We also discuss the raw vegan lifestyle, sustainable fashion, and how to navigate brand collaborations. You’ll love Agnes’ real, down-to-earth philosophies, and also gain some insight to improve your health and your social media game. Increasing stamina with a mostly raw, plant-based diet. Being mindful of what you eat. Being a vegan role model for young dancers. Being an influencer and partnering with brands in line with your ethics. Sustainable fashion and consumerism (for Fair Trade fashion, shop beadandreal.com). Agnes’ favorite restaurant: Au Lac in Fountain Valley and DTLA. Look up your local Pig Vigil at TheSaveMovement.org. Follow Agnes @artsyagnes on Instagram. Bill Muir, also known as SGT. Vegan, doesn’t make excuses. A vegan since 1992, Bill has traveled to 47 countries, served in the army, and was deployed to Afghanistan, all without breaking his commitment to his cruelty-free diet. Bill completed the brutal basic training on a plant-based diet and went on to become a medic and paratrooper, never wavering from his mission to help others. He now works as an RN at the VA Center of Los Angeles and wrote a book, “Vegan Strong,” to dispel the “hippie” myth surrounding a vegan diet. Bill proves that you can maintain your health and your ethics no matter your circumstances, and he is working to help others realize this fact. Bill’s travel tips: Always have a plan, and use the Happy Cow app to find vegan options near you. Anysoldier.com, a care package website for soldiers. Bill’s concern with the low-quality food provided at VA centers. Making vegan options more accessible through fast-casual concepts, rather than high-end restaurants. Follow Bill by visiting his website, sgtvegan.com, on Instagram @sgt_vegan, and pick up his book, Vegan Strong, on Amazon. You might know her as Dr. Temperance “Bones” Brennan on the smash television hit, “Bones,” but today, Emily Deschanel is just playing her cool, laid back self as a mom, friend, and vegan. Learn what goes on behind the scenes of a film set as Alexandra and Emily discuss their experiences as vegan actresses and where they found red carpet-ready and vegan-friendly fashion. Emily also talks at length about her experience raising two young vegan kids and living with a not-quite-vegan husband. We had a blast chatting with Emily; despite her fame, she’s so down-to-earth and real. Grab a plant milk latte and join in our fun conversation! Keep your bulk but drop the dairy. Vegan bodybuilder and influencer Brian Turner don’t suffer any loss of gains since switching to a plant-based diet. He attracted social media following after documenting his horrific acne experience as a teen on YouTube. After intense Accutane treatment that ultimately failed, Brian cured himself of his chronic skin condition by ditching dairy, and eventually, all animal products. He’s an animated guy with a can-do attitude, explaining everything from nutrition and eating patterns as a vegan bodybuilder, to “Bro Science,” to where, exactly, he gets his protein. He also shared his favorite mass gainer shake recipe. For the gym newbies and gym rats, this is an episode you don’t want to miss. How Brian cured his severe acne by ditching dairy. The serious side effects of Accutane and the issue with Big Pharma. How a vegan bodybuilder (and everyone) can get plenty of protein. Unhealthy bodybuilding eating habits, like binging and experiencing cravings. Brian recommends the HappyCow app or website to find vegan food anywhere you are in the world. 3-4 frozen bananas, 2 cups other fruit (mix of pineapple, mango, strawberries), a couple handfuls of spinach, splash of almond milk, 2 tablespoons cacao nibs, 1 scoop of Vivo Life protein powder. Get in touch with and support Brian by shopping at his fitness apparel line, BeyondtheWeak.com, listening to his podcast, Beyond the Podcast, and watching his workouts, recipes, and helpful tips on his YouTube channel. Poop. It might not be dinner table conversation, but there’s no denying it’s on everyone’s minds. If you ever feel bloated, constipated, or experience more serious digestive issues, it could be due to your diet. Plant-based and board-certified gastroenterologist Dr. Angie Sadeghi walks us through all our burning questions about our gut including colonics, enemas, probiotics, and more. Learn how to become more “regular” and diversify your gut microbiome, so get a pen and paper ready; you’ll want to take notes! You don’t need to experience trauma to feel depressed. You don’t have to grow up in a certain zip code to be a drug addict, and you don’t have to have obese parents to develop a food addiction. Adam Sud grew up in a comfortable household with a loving family, yet he experienced all of these things. After years of Adderall abuse and excessive consumption of fast-food, Adam tried to commit suicide. Unsuccessful in his attempt, he finally committed to seeking help and discovered the healing powers of the plant-based diet - not just the physical effects, but the mental benefits as well. Adam lost 160 pounds and titrated off all of his medications, including his antidepressants. Now healthy and medication-free, Adam devotes his life to helping others, proving that no matter how far one has fallen, there is always a way out. Most doctors receive less than 24 hours worth of nutrition education during their four years of medical school; they prescribe pills and surgeries without first looking at their patients’ diet. For Dr. Milton Mills, this is not the case. A critical care physician working at an ICU, Dr. Mills is no stranger to patients suffering from advanced stages of chronic disease. His first recommendation? Ditch dairy. He is on a mission to educate the public about the consequences of dairy - to both individual health and that of society. He supports his claims with medical evidence, and we take a deep dive into exactly why dairy is so harmful. He is truly passionate about this topic, and it was a pleasure to sit down with him and learn so much. Health risks of consuming dairy, including acne, digestive problems, osteoporosis, and certain cancers. Lactose intolerance and people of color. Government involvement in the dairy industry and dairy promotion. The Physicians Committee for Responsible Medicine. NutritionFacts.org YouTube for science-backed, easily digestible, and subject-specific videos on health and the benefits of a plant-based diet. 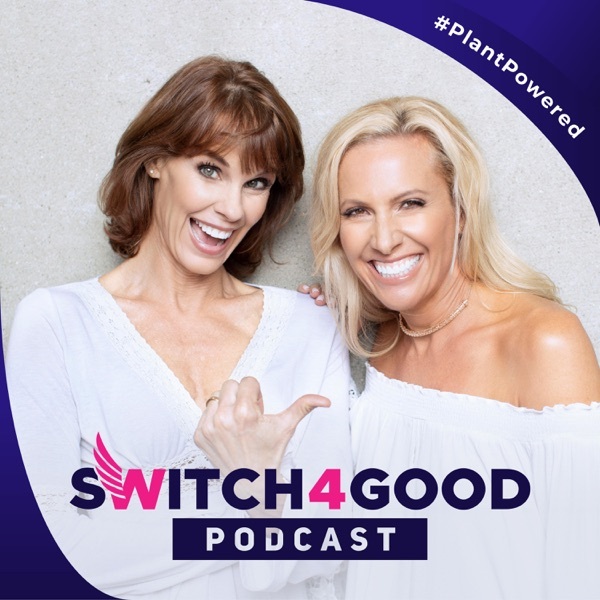 Switch4Good is a strong and growing coalition made up of dairy-free athletes, trainers, doctors, nutritionists and influencers. Some of us have won Olympic medals and some of us simply take the stairs instead of the elevator. We have all learned that cow’s milk is not a health food and understand that ditching dairy is a straight path towards living a longer, more fulfilling life. Our mission is to empower people to take control of their health by eliminating dairy. We employ athlete success stories and indisputable facts to educate the masses about the health hazards of the dairy industry. We are a united global team of dairy-free athletes, trainers, physicians, nutritionists, and inspirational leaders paving the way for superior health and unparalleled athletic performance through a dairy-free future for all.